And a reminder, folks - check out the blog if you're not aware of the current vote incentive to win custom artwork. Epic win, as I believe those pesky kids say nowadays. Real? Are we talkin' an Inception like reality here? MT - Inception reality? Come on - that was based on an old Scrooge McDuck comic from about half a century ago where the Beagle Boys had a machine to plant dreams and all that. It's not Inception reality - that's just borrowed! I'm thinking more likely "Hello Darkness, my old friend. 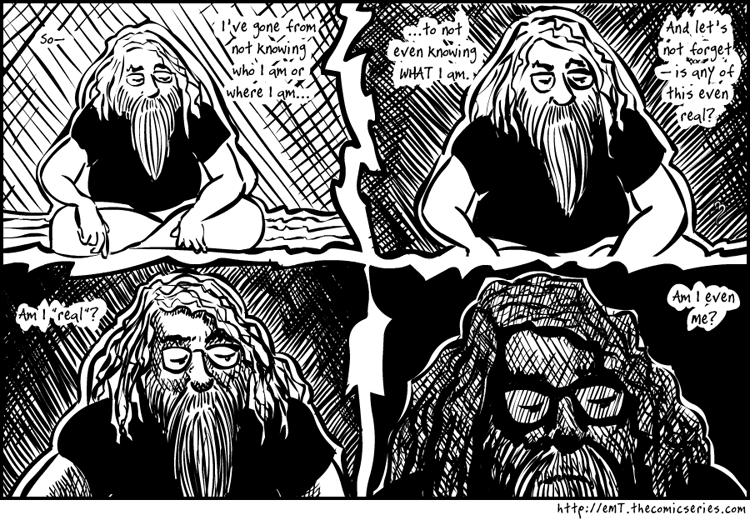 I've come to visit you again..."
31 strips before meditating...are you going to a nice place? Technically, it was only 22 strips before meditating. The other 9 were pre-strips or holiday strips, not an actual part of ExperiMental Record One - T.I.M.